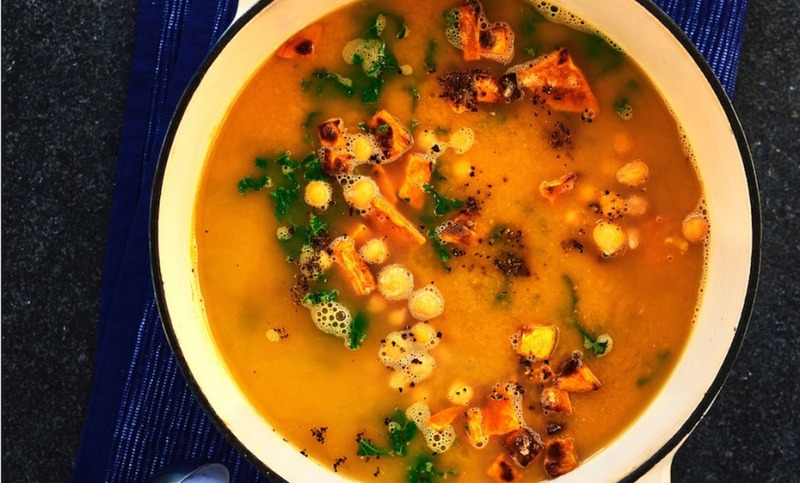 A simple soup to support those 2019 workout goals! The perfect power-up for gym bunnies or anyone on a new year health-kick, this high-carb lunch is aimed at regular exercisers seeking to build muscle. James Haskell, who co-wrote new book, Cooking For Fitness, with chef Omar Meziane, says it’s ideal for batch-cooking. 1. Preheat your oven to 200°C. Heat the olive oil in a large saucepan over a high heat. Place the garlic and half of the sweet potato in the pan and cook for two to three minutes without colouring. Add half of the chickpeas and continue to cook for one minute. 2. Boil the kettle and pour the one-and-a-half litres of hot water into a jug, then dissolve the stock cube in the water. Pour the stock into the pan of sweet potato and add the cinnamon and cumin. Bring the soup to the boil and then turn down to a gentle simmer. Cook for 25 minutes, or until the sweet potato is cooked through. Allow the soup to cool a little before placing it into a food processor and blending until smooth. Adjust the seasoning, and pour back into the saucepan. 3. While the soup is cooking, place the remaining potato chunks on a baking tray, and bake in the oven for 15-20 minutes or until cooked through. 4. Place the saucepan of soup over a low-medium heat and add the remaining chickpeas and the kale. Now add the baked sweet potato chunks into the soup. Serve as soon as the soup is nice and hot. Cooking For Fitness by James Haskell & Omar Meziane is published by Haskell Publishing. Available online now.